Massive Fantasy Novel and Kindle Fire Giveaway! Holy crackers, it’s RELEASE DAY!! It seemed like my release took forever, but the last week it seems like time has flown. But, it’s now here and I couldn’t be happier! 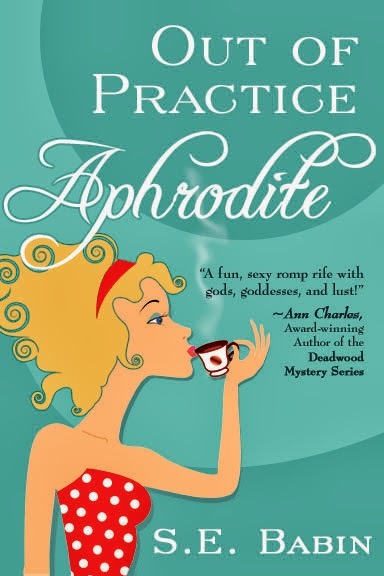 The release day for Out of Practice Aphrodite is finally here. I have several things going on today. The giveaway to win a Kindle Fire HD and a handmade leather case from JoeV Leather has started. You’ll see a Rafflecopter Widget at the top of my blog. Go there for a chance to win. The contest ends at midnight on April 4th. Also, I’m guest posting over at Laurie’s Thoughts and Reviews today. Head there and comment on the blog for a chance to win a coffee and wine themed gift basket, put together by yours truly. At the end of the tour on April 4th, one person will be randomly selected to win. As the tour progresses, I’ll be updating social media and my blog to tell you where I’m at and what I’m doing. Thanks for making this an amazing release day! Thanks, Anna! It's been a whirlwind of a day. Thank you! It's so cool to finally see my baby out there LOL! Good luck w/ the release! To answer your prompt, I would say that the book that has had the greatest impact on me to date has been 'Mutual Aid: a Factor of Evolution' by Pyotr Kropotkin (late 19th/early 20th century zoobiologist/economist/social geographer). It redefined the manner in which I view ecologies and social structures, noting that mutual aid and defense are more prevalent survival strategies than competion, in opposition to traditional western views on ecology/social structure.